Warning the following contains spoilers from the live feeds. Hey Big Brother Buddy I am back with a jam packed alliance update. I feel that I owe you that due to the long absence. But I’ll spare you the chit chat lets get right into it. Forced together with the potential to win cold hard cash. This trio has five thousand reasons to stick together. Derrick and Frankie are the two house guests with big secrets and even hinted at that to each other. I’m fairly certain they have succeeded in their first mission by convincing the house that Zack is BB 15 house guest Amanda Zuckerman’s cousin. They even have Zack going around jokingly saying its true. As far as game though they are keeping distance as to not draw suspicion. But that hasn't stopped other house guests from thinking Donny might be some sort of America’s Player. 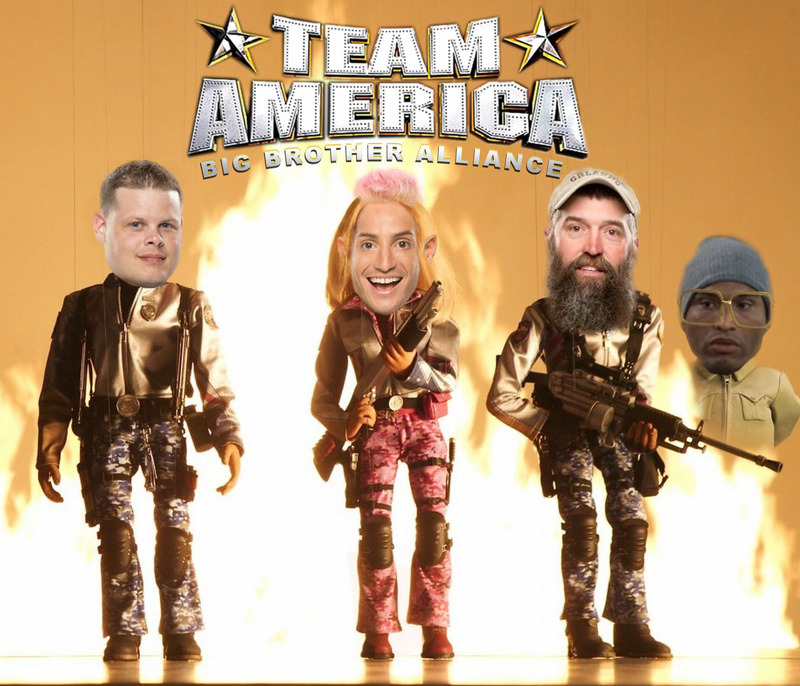 How could we not mention this season's craziest alliance. Devin exposed the BS so everyone knows about it but are uncertain about how real it actually was (or still is). Everyone, mainly Derrick and Christine, did a great job to deflect and give the appearance that it wasn't that real. There is very little loyalty left among the group except for the smaller alliances that formed it. This five-some has been together for awhile but official sealed the deal with a name just last night. Formerly know as Jump Street (a much better name but BB told them its copyrighted). This the second spanish themed name of the season ( lol El Cautro). These three are a tight group but Derrick and Cody know that Zack is a well a “Landmine”. They have Hayden hooked as an ally too. We all want these two to just live happily ever after. That storybook ending seems shaky as of late. I think they will try and protect each other but if it comes down to it they will let the other walk. Caleb is so dedicated and blinded by “love” that he literally volunteered to be nominated for her. Amber could not care less. Nicole and Christine are BFFs. Nicole is doing her little flirt-mance with Hayden. And all three have a working relationship. There are cracks between Nicole and Christine game wise though. This is really just for Derrick to keep Victoria close and gather what little information she has. Not really official but they are friends. Wednesdays Veto episode will bring some tears to your eyes guaranteed. (Well at least me) Donny after winning Veto brought the veto to the sick Jocasta granting her safety for the week. Brittney - She can’t seem to trust anyone long enough to finish a conversation, let alone form an alliance. What do you think is the strongest alliance? Tell me your thoughts in the comments below. You can also reach me on twitter @CoryCShow Make sure you check back for all the Big Brother content you desire. And download the Big Brother Buddy App and follow us on twitter @BigBrotherBuddy for instant updates from the house. Also special credit to reddit user Noslodecoy for the awesome Team America picture. Nicole Hayden and Christine have the best alliance! They are fun together and severely underrated. All three are actually really smart in this game. Hayden is committed to Nicole but people know that and could end up putting a target on them both. Also Nicole is getting suspicious of Christine and rightfully so she has been making deals behind her back all game. I agree. His true alliances are Team America and now "The Hitmen" with Cody. He considers everything else a buffer. People are catching on to him though so he needs to be careful. If he can keep the target off him he could potential win the whole thing.